Tomorrow I will FINALLY share the culmination of all of Lucky's Halloween Birthday party planning. I had so many awesome photos of the food we served to make a wonderful Halloween Spread that I had to split it into two posts. 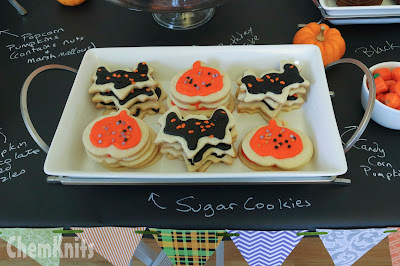 Today I'm going to show you the awesome snacks, cookies and other edible treats we served to make a fun themed party. 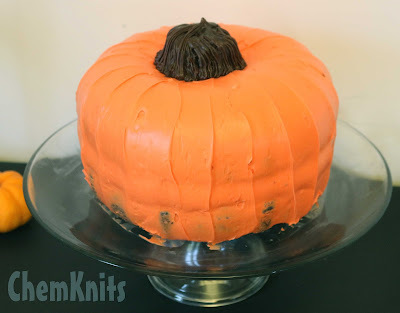 Pumpkin Cake - I have already dedicated a whole blog post to the construction of this cake. This cake has 2 layers but I had to bake 3 because I accidentally cracked one when taking it out of the bunt cake pan. I crumbled up the chocolate cake and mixed it with half a can of chocolate frosting to create "dirt" that I topped with some sour gummy worms (shown in the first picture of this post.) There is always space for some extra "cake" at a birthday party! 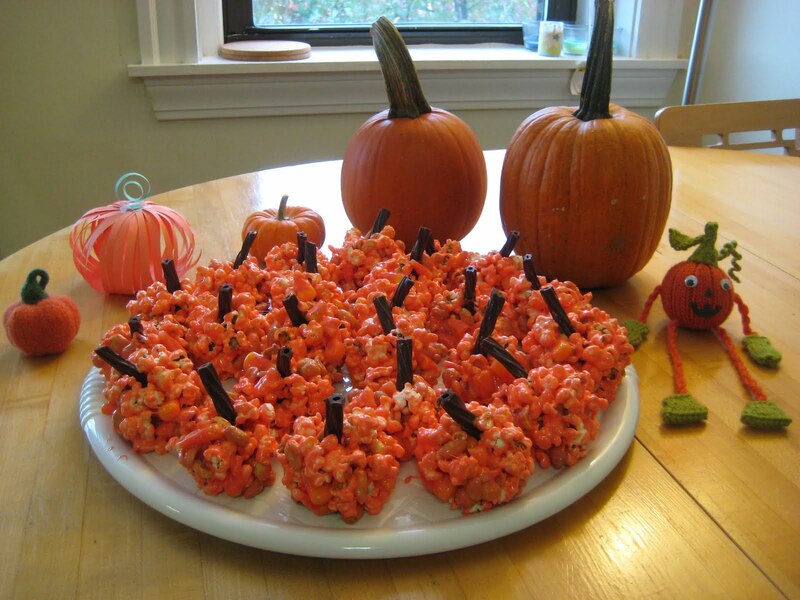 Pumpkin Popcorn Balls - These are one of my favorite treats to make for Halloween, Thanksgiving or really any fall themed event. My family LOVES pumpkins and these are tasty for days and days after they've been made. I've never found green twizzlers for the stems so we usually stick with the standard red ones. Frosted Sugar Cookies - Themed cookie cutters and sprinkles are the simplest way to add some theme to a party. I used bat and pumpkin cookie cutters and a boxed sugar cookie mix to make the cookies. I purchased cookie icing from grocery store baking isle and then topped them off with some Halloween themed sprinkles. Black Cat Cookies - These are another Brown family favorite. I follow the linked recipe and get 24 cookies. Shaping the pressed cookie into a cat shape is easier than you might expect. 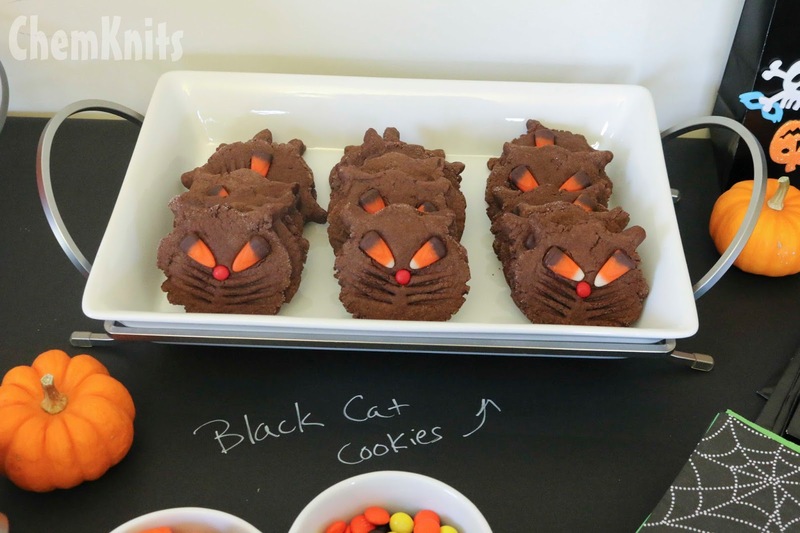 Just make sure to press in the candy corn eyes and cinnamon nose while the cookies are still hot. Yum! 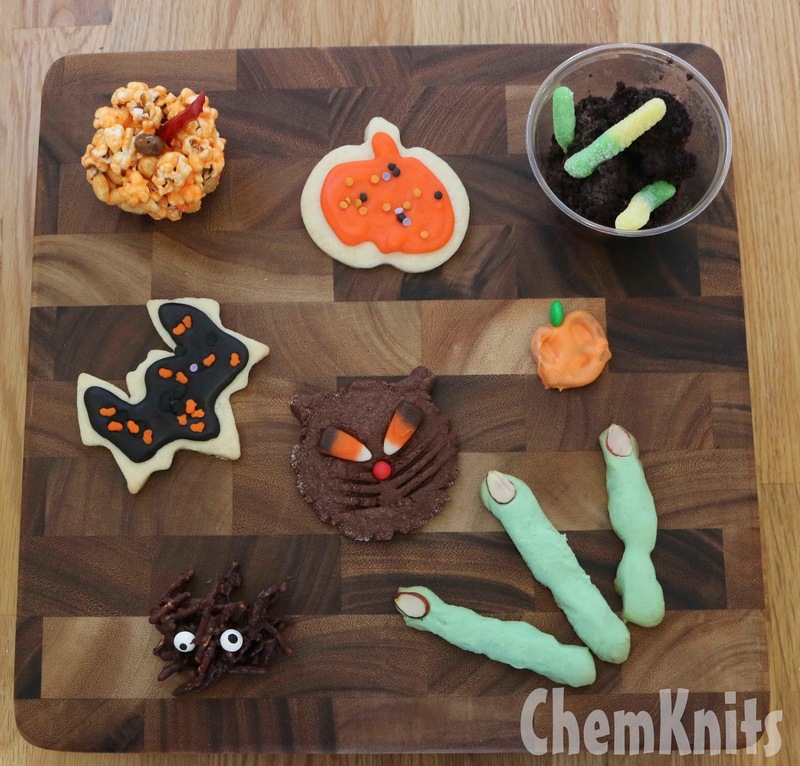 Zombie Finger Cookies - Also known as witch finer cookies, these butter cookies are a light and tasty treat with an almond taste from extract and the almond slice fingernail. I like to add green food coloring to give the cookies a little extra pop. I prefer to use almond slices to whole almonds since the little cracks make the nails look like they've been through some battle. I bake the cookies with the almonds on the tips and then add some red gel food coloring after to glue them into the impression they've made. Chocolate Spiders - Chocolate covered chow mein noodles with candy eyeballs take very little time to make. Instead of the candy melts I melted semi-sweet chocolate chips in the microwave and covered the crunch noodles. 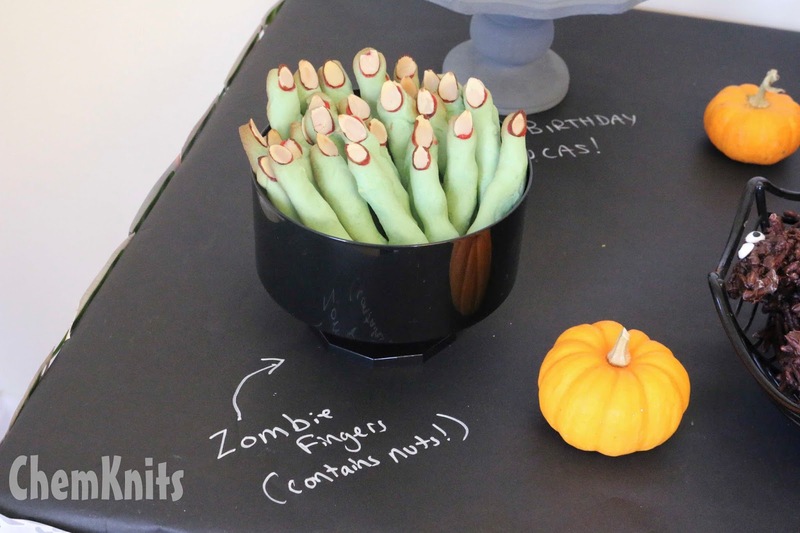 Pretzel sticks would also work well for this treat. 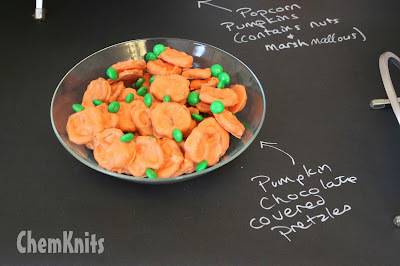 Pumpkin Pretzels - I thought I was covered for sweet treats until I came across these chocolate covered pretzel pumpkins on Pinterest. I used some orange candy coating and green M&M's to cover standard twisted pretzels in one last sweet homemade treat. 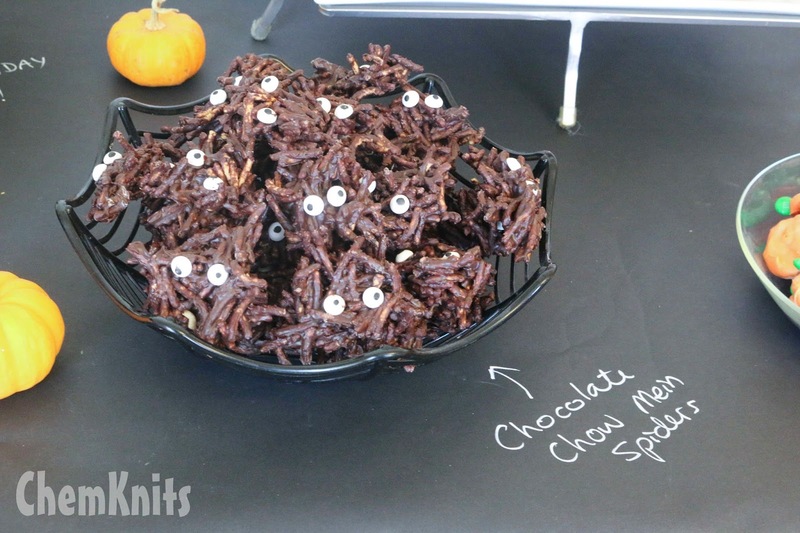 It is acceptable to have many sweet treats at a Halloween party, but I wanted to make sure we also had some savory and salty options. 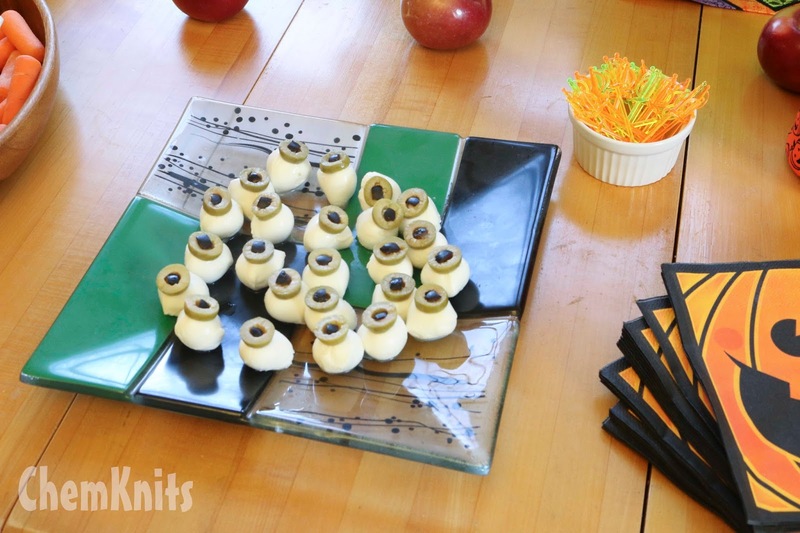 Mozzarella Eyeballs - Little balls of mozzarella cheese topped with a green olive slice with a quarter of a black olive slice in the center. These eyeballs lasted about 15 minutes at the start of the party! I thought the sword toothpicks made a fun touch, too. 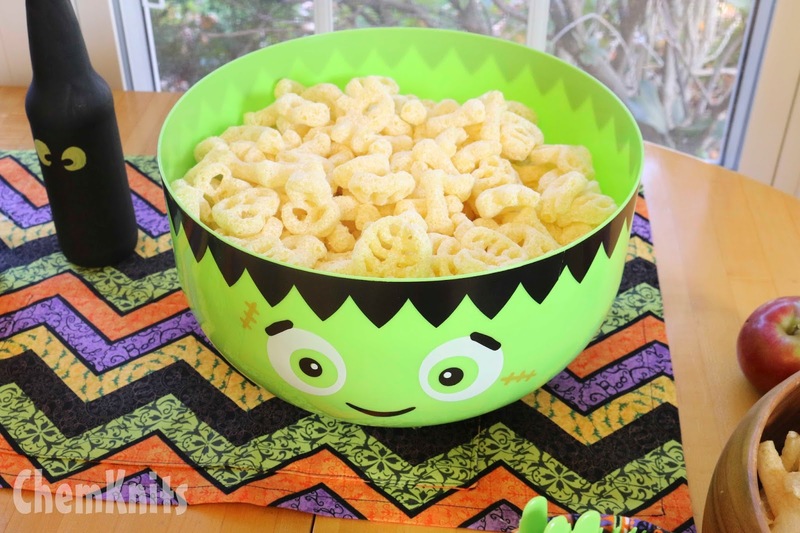 Spooky Cheetos - In 2015 Cheetos brand offered a skull and bone shaped Cheetos around Halloween. I couldn't resist such an easy addition to my themed snack table. 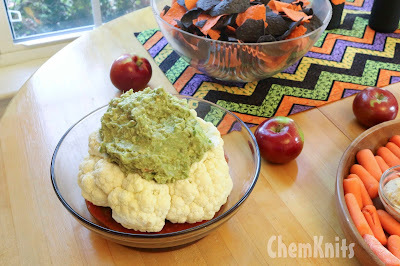 Guacamole Brain - Have you ever noticed that a head of cauliflower looks a little like a brain? If you hollow out the head of cauliflower it makes a great spooky bowl for guacamole! Resting on a bed of salsa and pair it with some orange and black chips and you're ready to go for a Halloween Party. 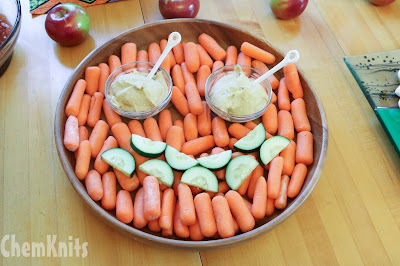 Jack-o-Lantern Veggie Platter - This veggie tray has a carrot base, cucumber mouth (that I replenished as needed) and hummus eyes for dipping. I'm feeling hungry now that I'm revisiting all of these party snacks! I can't wait for you to see how this all came together in tomorrow's post. Stay tuned to see Lucky's Halloween Birthday Party! What's this? A hat for another pal!